Amanda “Leoa” Lourenço Nunes is the reigning defending UFC Women’s Bantamweight Champion. She was born on the 30th of May 1988 in Bahia, Brazil. She has a black belt in BJJ and a brown belt in Judo. Amanda has won Naga Worlds in her weight class and absolute, took gold in the Pan-Ams and Mundials. She is also a Brazilian State Jiu Jitsu Champion. 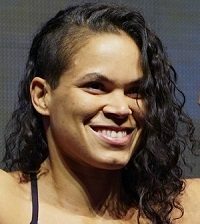 Amanda Nunes made her MMA debut in March of 2008, the fight didn’t last very long as “Leoa” had to tap out due to an armbar after only 35 seconds. She rebounded with seven wins against tough competition. She fought Vanessa Porto, Ediane Gomes and Julia Budd and beat all of them by finish. Her debut came against Sheila Gaff on UFC 163: Aldo vs. Korean Zombie. She defeated Gaff by TKO in the first round. She then defeated future Featherweight Champion Germaine de Randamie by TKO, once again in the first round. Her first UFC loss came against top contender Cat Zingano, a fight Nunes was dominating, but tired in the last round and got finished by TKO. Amanda Nunes continued her winning streak by beating Shayna Baszler, Sara McMann and Valentina Shevchenko to earn a shot at champion Miesha Tate. She faced Tate in the main event of UFC’s block buster card UFC 200: Tate vs. Nunes. 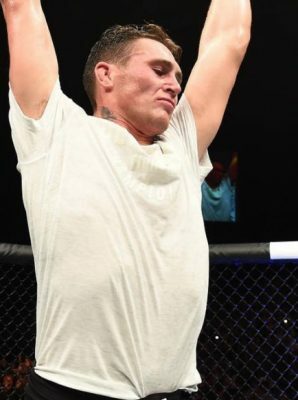 After a even fight on the feet, Nunes finally got Tate down and locked in the rear-naked choke to become the first openly gay UFC champion. Her girlfriend and UFC strawweight Nina Ansaroff congratulated Nunes with a kiss. Aanda Nunes first title defense was against womens pioneer and super star “Rowdy” Ronda Rousey. Rousey was coming back from a brutal knockout loss to former champion Holly Holm. Rousey looked very tentative on the feet and Nunes capitalized and finished Rousey with ease in the first round. Amanda Nunes was supposed to face off against Valentina Shevchenko at UFC 213 but illness forced “Leoa” out of the fight. The fight was rescheduled and the two will now face off at UFC 215: Johnson vs. Borg in Edmonton, Alberta, Canada on the 9th of September.